This is 90% geared for purely console/terminal/pty/tty/ssh/putty/telnet/tmux/screen users. I've only just the past couple years started understanding why it was key to learn vim, in the past I never had the patience for it and preferred nano-like editors. 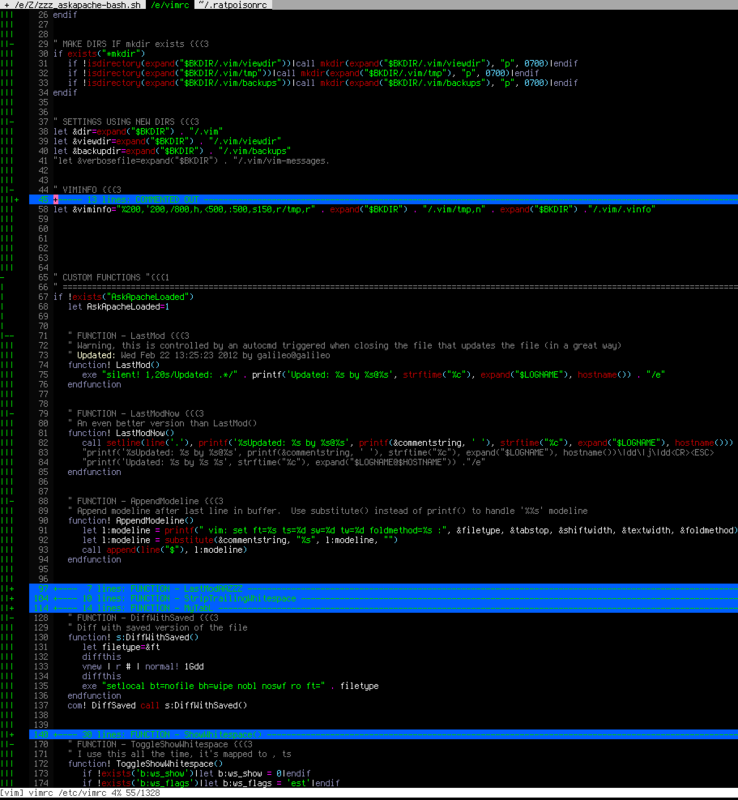 Now vim is all I use when on linux, it's so much more productive.. especially with a customized vimrc file. This doesn't require a git checkout, a vim update, a bash update, an OS update, a plugin. No. This is a single file that I use on Arch Linux, NetBSD, FreeBSD, OpenBSD, Debian, Ubuntu, Cent OS, Red Hat, and that's it so far. This is geared for users who use SSH more than anything else. Of course, it works perfect on an X enabled box locally as well. I install this as /etc/vimrc if possible. Individual users can use a vim config file in their home directories. For the portability needed to work on many different systems, this doesn't rely on any plugins other than those built into the default installation of vim 7.0. It works well on all types of consoles, and depending on the TERM environment variable (and whether it has the right term capabilities) it will load 256 color support or not. Usually on a new system I just scp this right over and it works without any modifications. But an ongoing Work in progress.
" <       Maximum number of lines saved for each register. let &viminfo="%200,'200,/800,h,<500,:500,s150,r/tmp,r" . expand("$BKDIR") . "/.vim/tmp,n" . expand("$BKDIR") . "/.vim/.vinfo"
exe "silent! 1,20s/Updated: .*/" . printf('Updated: %s by %s@%s', strftime("%c"), expand("$LOGNAME"), hostname()) . "/e"
"printf('Updated: %s by %s %s', strftime("%c"), expand("$LOGNAME@$HOSTNAME")) . "/e"
exe "1,50s/AA_UPDATED=.*/AA_UPDATED='" . strftime("%c") . "'" set backup        " Make a backup before overwriting a file. Leave it around after the file has been successfully written. set magic            " Enable the "magic"
set noexpandtab          " no expand tabs to spaces"
set diffopt=filler,iwhite    " ignore all whitespace and sync"
" (happens when dropping a file on gvim). Also don't do it when the mark is in the first line, that is the default position when opening a file. Here is a colorscheme file optimized for 256 colors. It will work if saved in ~/.vim/colors/askapachecode.vim or likewise in your runtimepath. Additionally, you could just paste it in the bottom of the above vimrc. The code really needs to be cleaned up, but it looks awesome.
" COMMON GROUPS THAT LINK TO DEFAULT HIGHLIGHTING.